Posh striker Conor Washington struck this volley over the bar against Wigan. Photo: David Lowndes. Peterborough United manager Graham Westley said he enjoyed his side’s display against League One promotion fancies Wigan tonight (October 20), but hated the result. 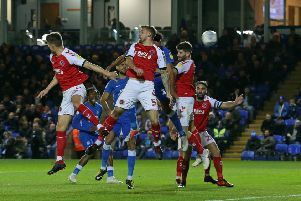 Posh lost another thrilling game at the ABAX Stadium 3-2 after battling back from 2-0 down to draw level with goals from Erhun Oztumer and substitute Souleymane Coulibaly with nine minutes to go. Unfortunately Wigan scored within 77 seconds to take a lead they never looked like surrendering before the final whistle. Souleymane Coulibaly (hidden on the ground) equalises for Posh against Wigan. Photo: David Lowndes. The defeat - just a second in seven League One games - dropped Posh four places to 13th in League One. Westley blamed naivety at either end of the pitch against vastly more experienced opponents. Westley said: “Young players will make mistakes and that was the case for us at both ends of the pitch. “The defending was naive for the first couple of goals, but we can also reflect on the great character, desire and quality we showed to get ourselves back into the game. “We could easily have been two or three goals to the good before we found ourselves two down. The difference was Wigan showed clinicality whereas we didn’t. “We felt we could get back into it though as we knew we would create chances, and we managed to take a couple of them in the second half. “We won the second half, but unfortunately the game got away from us in the first half and in the end we left ourselves too much of a mountain to climb. “I enjoyed our performance, but I hated the result. “We want to entertain, we want to excite and we want to show off the talent we have to the full. We did that going forward tonight. “Erhun Oztumer is an incredible talent who does wonderful things. He sees things other people don’t, but he picked up a knock as we equalised and he should have stayed down and forced the referee to stop the game. Instead he got up and tried to carry on. “Erhun is the sort of player you would happily pay to watch on a Saturday afternoon even if you didn’t support Peterborough. “I go away really encouraged by what I’ve seen from us against a really top team at this level. Joint top scorer Marcus Maddison was again missing from the Posh matchday 18. He has a chance of being fit for the visit of Darren Ferguson’s Doncaster Rovers to the ABAX on Saturday (October 24).